I’ve been a bit absent from WordPress recently. There are two reasons for this. The first is technical issues. I’ve been getting used to a new laptop, and it’s taken me a while to get everything working together and access to my photos. Also, I lost my internet connection for a while when I upgraded my router. It was my own fault, I didn’t read through the instructions first and it was only when I’d disconnected the old router that I realised I had to phone up to get the new one working. Which would have been fine, only I needed my account number. And everything record I have of that account is online, and I couldn’t get online because I’d turned the router off. You can see my problem, it was a vicious circle. The second reason for my absence is that I’ve been spending a lot of time preparing for my trip to the US. I’m really excited, but also bricking it slightly. I’ve put in a lot of work to get the most out of my time away, especially is Alaska, and I can’t wait to share it with you all. 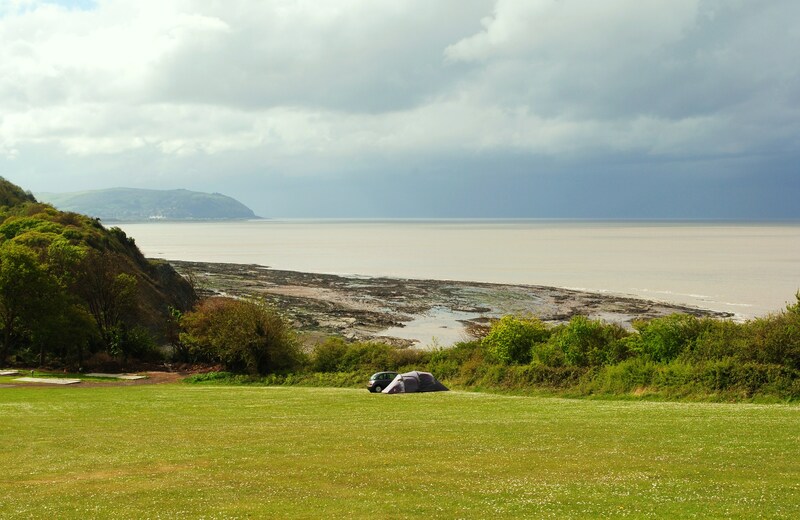 Before I head off, I had to write about my recent camping trip to Watchet in Somerset. Admittedly, May Bank Holiday isn’t the best time of year to camp in the UK. Although, as you can see from the photo below, one advantage of camping in May is that you don’t have to fight for space. If it was just me, there is no way I would have braved the wind and rain to spend two nights in a tent (which was also on a really steep hill, although it doesn’t look like it in the photo). But, my two godchildren had been begging me all winter to take them camping again. Once I’d persuaded them that maybe we should wait until the wind chill was at least above zero, we compromised and I promised I would take them before I left for the States. The weather wasn’t great, but it certainly wasn’t as bad as in some parts of the UK and we didn’t let it ruin our fun. Situated just over the bay from Minehead (you can just about make out the white tent of Butlins in the above photo if you look closely), Watchet is possibly the friendliest place I have ever visited in the south of the UK (and, believe me, that’s a huge compliment, I’m from Lancashire). Everyone was so lovely and helpful, especially to my two young godchildren. We were all made to feel very welcome. We stayed about a mile outside Watchet, and there is a lovely path along the cliffs into town that even the kids didn’t complain about walking. We weren’t overly impressed by our campsite. It seemed to me to be a caravan park that had a field too steep for even caravans to park in, so the owners decided to charge people £14 per night to pitch their tent there. We did our best with the hill, but kept waking up every couple of hours and having to shuffle back up the hill again. Where we rolled against the bottom of our tent also caused it to flood the first night, although thankfully the weather was nice enough on the second day to let it dry out. It took all three of us to man the barbeque as well, as the sausages kept rolling off the grill! Previous PostPrevious My Dream Trip is becoming a reality!